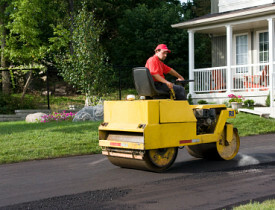 Driveway resurfacing is an attractive, long-lasting and cost-effective option for renewing an old asphalt driveway. A typical project involves repairing and preparing the old driveway surface and applying a 1 -inch or thicker layer of new hot mix asphalt (or "blacktop," the same stuff used on roadways). The new layer is compacted and its edges are finished, as needed, to create a smooth continuous surface that can be just as durable as a freshly laid drive. Asphalt resurfacing also works over concrete slab driveways, provided the concrete is structurally sound and hasn't shifted. The cost of driveway resurfacing ranges widely and may start as low as $1 per square foot and go up to over $3 per square foot. However, due to the many variables involved, such as the condition of the old driveway, the type and finish of asphalt you want, the shape and size of the job, etc., basing your search on generic cost estimates probably won't be of much use. Instead, the best approach to finding a fair price is to discuss your project with several local contractors to determine what needs to be done for a long-lasting, quality renewal. Once you have a list of priorities and a basic plan for the project, solicit bids from at least four local contractors (prices may vary considerably, so the more bids the better). This ensures that all prospective contractors are bidding on the same thing. Condition of Old Surface: How much repair work needs to be done? Removal and patching of broken sections, filling in low spots or scraping off high spots all influence the price. Transitions: Extra prep work is required to make sure the new surface will be level or flush with existing curbs, steps, patios, sidewalks, edgings, etc. Drains, water valves and other plumbing elements may need to be altered to conform to the new surface. New Material: The quality, density, thickness and finish (such as optional surface texturing) of the new asphalt directly affects the project cost. Be sure all proposed materials meet accepted standards for your climate and application. Edge Finishing: Exposed edges of driveways may be hand-stamped with a bevel for durability and a finished look. Once you've selected a contractor and know how much your driveway resurfacing will cost, a detailed contract is the best way to ensure you get what you pay for. With driveway resurfacing, it can be hard to assess the quality and success of a job until the next spell of rain or snow hits and you see how well the driveway drains. Make sure the contract includes guarantees for proper sloping and drainage of the new surface, as well as measuring the thickness of the compacted layer. Also make sure that each responsibility of the contractor is explicitly stated in the contract. For more information on driveway resurfacing and contracting, visit the National Asphalt Pavement Association (NAPA) site. If your concrete driveway just needs a little fix, you might be able to do it yourself. Give it a wash and inspect it carefully. If it's something that can't be fixed, you may be able to resurface it with blacktop, but you might need to replace the whole thing.